Though Carleigh Hoff refers to herself as a "doll artist," the word doll, as defined by Webster,* hardly comes close to describing the enchanting product of her creativity. 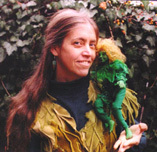 Within the walls of her Green Spirit Studio are born a breed that she calls "little people." They are, in her own description, "Spirit manifested." "The process of watching a new face, a new character, emerge from a simple ball of clay in my hands, is the most amazing thing," she says. "I am a midwife, birthing this new energy force and must listen carefully to help it grow strong. These characters, like those in a developing story, all have their own will regarding who they will become." Carleigh easily gives away credit to her creations, but it's actually her rich background in theatrical set design, costume design and other types of dimensional art which allow her "little people" to take form. She has worked in over a dozen costume shops in Hollywood, for Bob Mackie, on a Disneyland parade, and at Paramount Studios on the first Star Trek movie. She was also employed by Hasbro Toys to design exclusively for Jem (the cartoon series and doll). 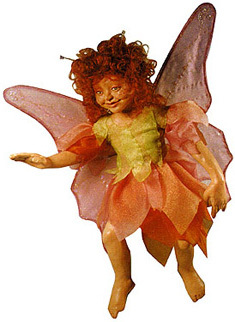 To Carleigh, doll-making is the perfect opportunity for combining her past experiences to create fantasy bodies and fantasy costumes, as well as the fantasy personalities that live inside. I like making faces!," she says. "Faces with character and emotion. It's the doll's face that dictates the body, pose, and costume that will tell its story. Perhaps the story is obvious, or perhaps each viewer will read it differently. I hope each doll will carry its viewers to another place, time, or emotional level. Such is art." Her characters stand like small actors frozen on a stage. "I am the artistic director," she remarks. Left: Medicine Woman- Out to gather herbs. 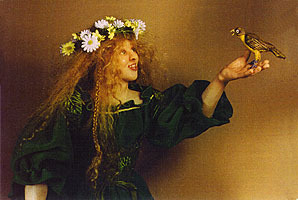 Right: Rosie: A fairy on the wing. 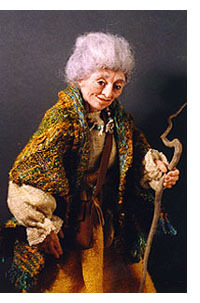 Each doll is created with incredible detail. From head to toe, every little curl or wrinkle is executed to mastery, contributing to the amazing life-like rendering that develops. Each is outfitted in a unique or authentic ensemble, down to delicate pouch or beaded decoration that completes the tale. Since working in mixed media requires a lot of "stuff," Carleigh is a saver and recycler. All those precious little scraps from the cutting room floors in "Sequin City" have moved across the country with her many times. They all come in handy in her quest to find just the right fabric or detail for one of her dolls. touch the hearts of their viewers." For a long time, Carleigh Hoff felt she was "a misplaced maker of magic, who had not yet found a home." Creating the art doll has finally taken her to a place where she would like to "hang her hat." 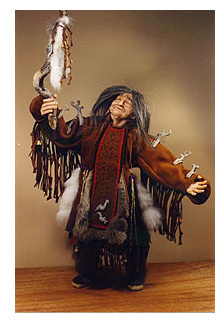 Right: Alma- A Siberian Shaman, "Calling of the Spirits"